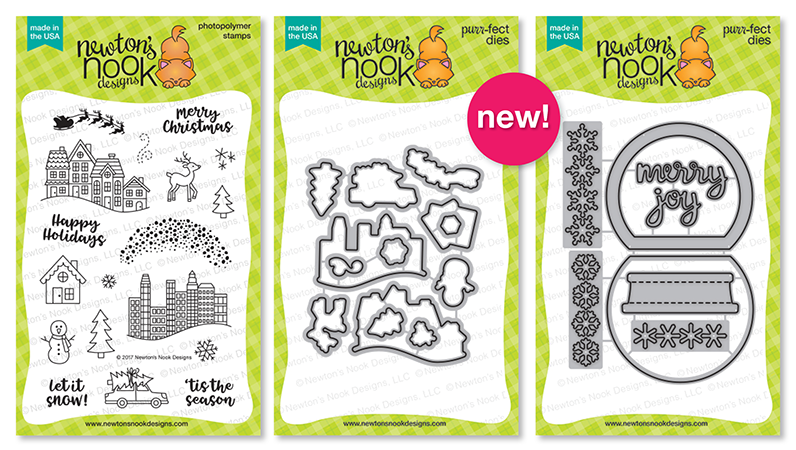 It's day 2 of the Holiday Release from Newton's Nook, today we are introducing Snow Globe Scenes and a stand-alone Snow Globe Shaker Die that coordinates. I'm using both products today and the Snowfall Stencil that was revealed yesterday as well. I started with a piece of watercolor paper and I added some Distress ink through the Snowfall Stencil to create a background, then I spritzed it with some water to move the ink around. Once the panel was dry I added it to an A2 size card base. I created a shaker with the Snow Globe Shaker Die set then I added some Copic Markers to the Base for a woodgrain look. This die includes all the pieces you need to create a shaker with ease. I stamped the scene using the images in the Snow Globe scenes set and colored them in with copics. I adhered them to the back of my shaker piece after filling it with some sequins and beads. Once it was all sealed up I adhered it to the card front and stamped a sentiment from the same set onto a banner. There will be some Double sided Foam adhesive and Acetate available in the store on Friday as well... So be sure to add some to your order and get started on those Shakers!!! 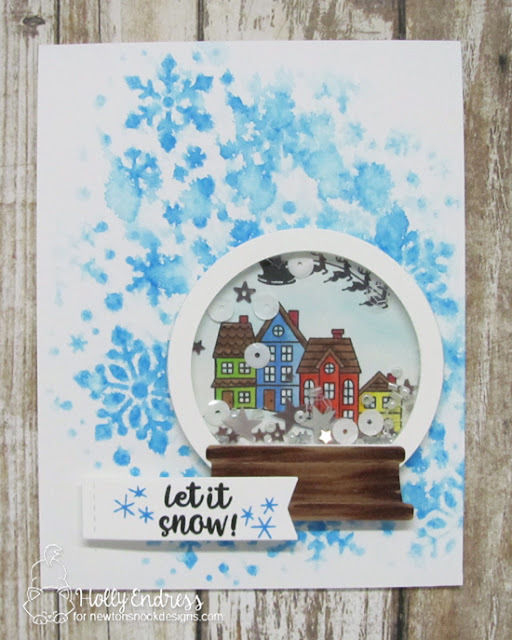 Would you like to win the “Snow Globe Scenes”Stamp Set? One stamp set will be given away to ONE lucky winner! Great card, really like your watercolor background. Your shaker card is just perfect ! Cute snow globe scene and love the snow flake background. This is a beautiful card and I especially love the background. 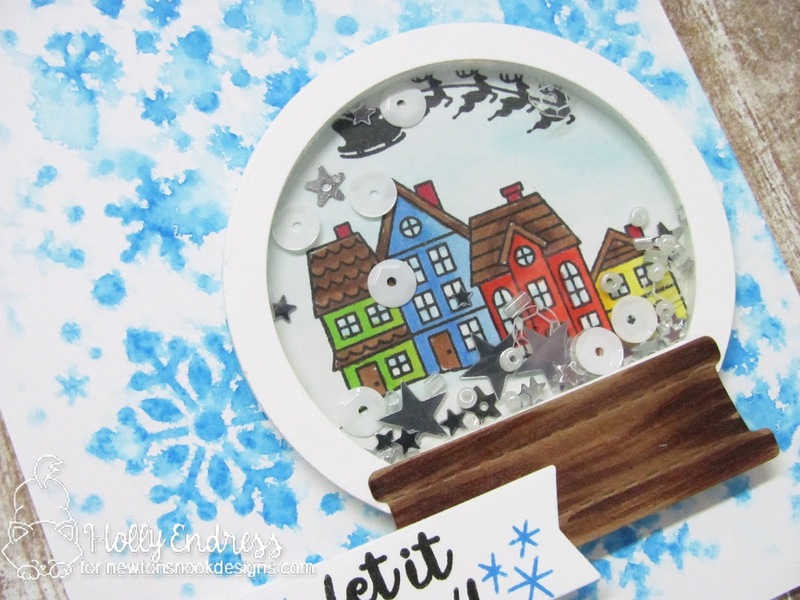 Such a pretty shaker snowglobe card - I didn't even notice the silhouette of Santa and his reindeer in the sky included with this set until i saw it on your card - I love it! Wonderful design. I love how you used the snowflake stencil. Love how you always share how your new goodies work perfectly! Darling snow globe card! Love the snowy background too! Your card is fabulous!! Love how you used the background stamp, too!! A wonderful snow globe on a beautiful snowy background!! Those new stencils are perfect for creating amazing projects. The possibilities are endless with them! The snow globe is so cute and there are so many possibilities. Your shaker snow globe is amazing! Lots of detail. Beautiful shaker card! I love what you did with the stenciled background too! So fun and wintery! Such a pretty card...love sweet images. Love the dreamy snowflake background with this shaker card. Wow! Beautiful card! I absolutely love the watercolor snowflake background! Great new set. I love the watercolour background on the shaker card!